The website as it appeared in 1999. The venture was the first of its kind in television history. Never before had a website been created with a direct tie to a national, syndicated television show, with the aim of becoming an interactive portal for viewers of the show. Designed by an MSL team of editors and graphic artists, headed by Robert Fischer and Lillian Fuentes, and with the technical assistance of Microsoft and U.S. Interactive, it was a site in its most basic form, at least by today's standards. 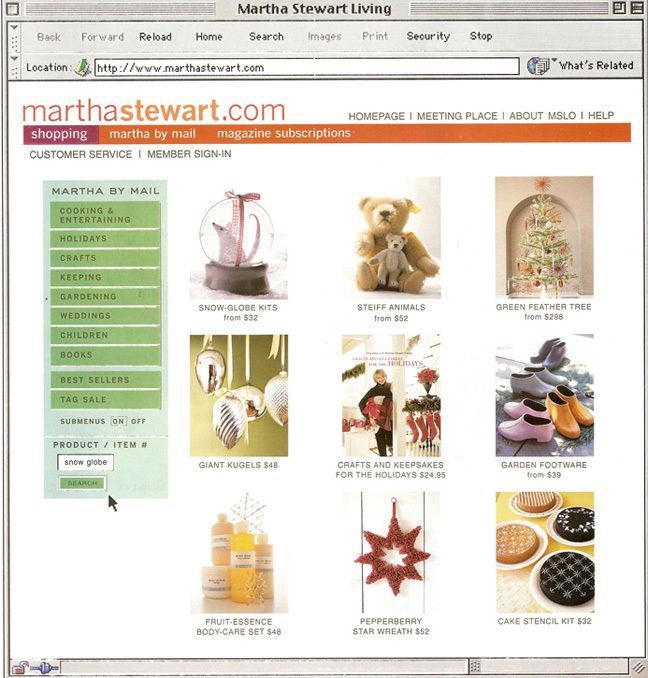 When marthastewart.com was launched, the Internet had only existed as a commercial and personal computer tool since 1994. During the first few years of its initialization, it was rare to find companies that were using the Internet as a primary business tool. At that time, many companies didn't even have official websites. 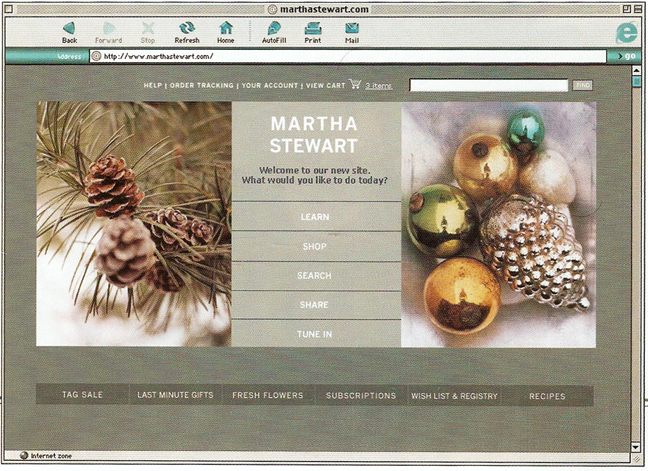 The design of the main page of Marthastewart.com was simple and clean, using photography originally published in the magazine as embellishment. This accompanied a weekly greeting from Martha on the main page about what could be found on the site. At first, little could be found at all, aside from repurposed articles from the magazine, step-by-step instructions for projects featured on the television show and basic company advertising. By the new millennium, however, a special web division was created at Martha Stewart Living Omnimedia and advancements in Internet technology were heartily embraced by the company and swiftly put into practice. By now, the Martha by Mail mail-order catalog division had a place on the web too with a special website where consumers could order and pay for items online, shaping the new direct commerce division at the company. It was integrated into the main Marthastewart.com site as well with photo galleries of the products and information about prices, shipping and returns. Eventually, subscription services also went online and people could subscribe to the various Martha Stewart magazines using the Internet. These elements made up the "Shop" category of the site. The website also became an archive of information - the site's original mandate. In the "Learn" category, visitors could locate previously published articles from any of the magazines, lists of resources and information about homekeeping, cooking, organizing, kids, decorating and gardening. Photographs from the magazine and instructions for the projects and recipes created by the editors and producers also appeared online. 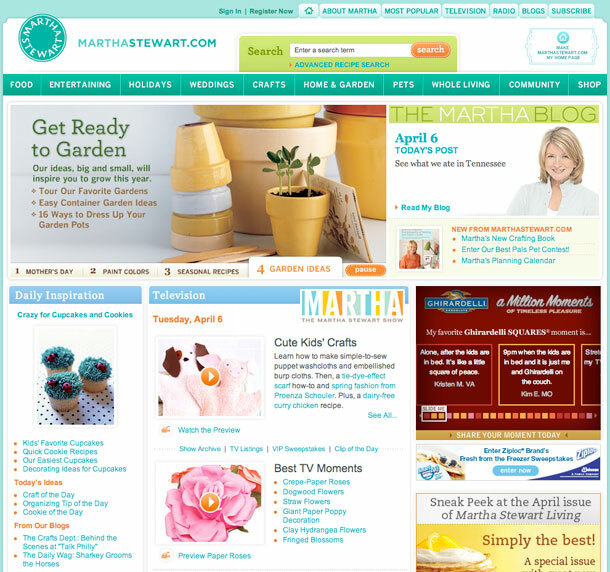 In 2002, there were more than one million registered users of Marthastewart.com, connected by online community forums on the site, many with personal profiles. Those registered to the site could receive newsletters about MSLO corporate initiatives, new product sales, information about products, as well as new projects and recipes to try, many exclusive to the website. Not all was seamless and smooth, however. The site was not as effective and organized as some of its chief competitors and there were persistent problems with the Martha by Mail segment of the site: confusing shipping information, incorrect links and sections of the site that were very difficult to locate or navigate. A much more challenging obstacle emerged when Martha was charged with criminal offenses related to an insider trading scandal. To help get her side of the story out, she and her lawyers launched Marthatalks.com in June, 2003. It was a public relations tool to both set the record straight and to allow Martha to communicate directly with the media and her fans about what she was going through on a personal level. The site was plain white enhanced by Martha's trademark green font and user menu. There were no images on the site, except for one on the main page, which changed periodically to reflect the season. In the first week of its launch, the site received 9 million hits and more than 50,000 emails from supporters. Thousands of these supportive letters were published on the website, along with favourable essays and articles about her criminal trial and legal documents supplied by her lawyers. 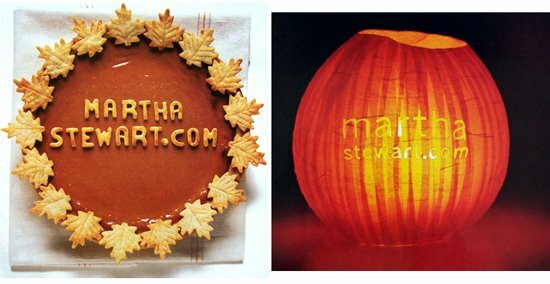 The trial and the ongoing technical problems with Marthastewart.com, in conjuction with the collapse of the Martha by Mail business in 2004, prompted a major revitalization of Marthastewart.com in 2006 and a relaunch in early 2007. The new website held much more content and was capable of hosting video streaming: segments from the new Martha Stewart Show could now be viewed online. The new site was also much more interactive with chat groups and personal profile pages where users could upload their own photos and share with each other, participate in workshops led by the magazine editors and ask for advice. Also in 2007, Martha Stewart launched her personal blog, called simply The Martha Blog. Here, fans could read about what was going on in Martha's world, from her new farm in Bedford to her home in Maine, with personal photographs and anecdotes. A number of other blogs were also launched supporting MSLO publishing ventures, including a Weddings blog called The Bride's Guide, an Everyday Food blog called Dinner Tonight and a Blueprint blog, which was later shut down when that magazine folded. 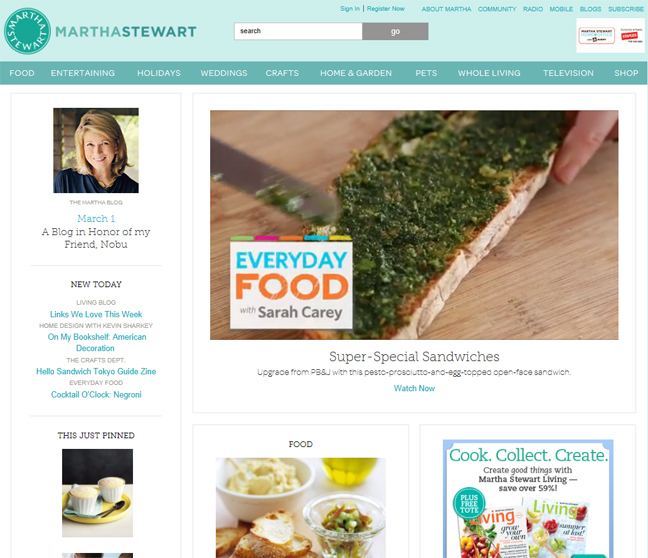 Not to be left out of the direct commerce sphere, Marthastewart.com developed subsidiary commercial websites that featured Martha Stewart product lines, including furniture, the new Martha Stewart Collection at Macy's and Martha Stewart Crafts products. 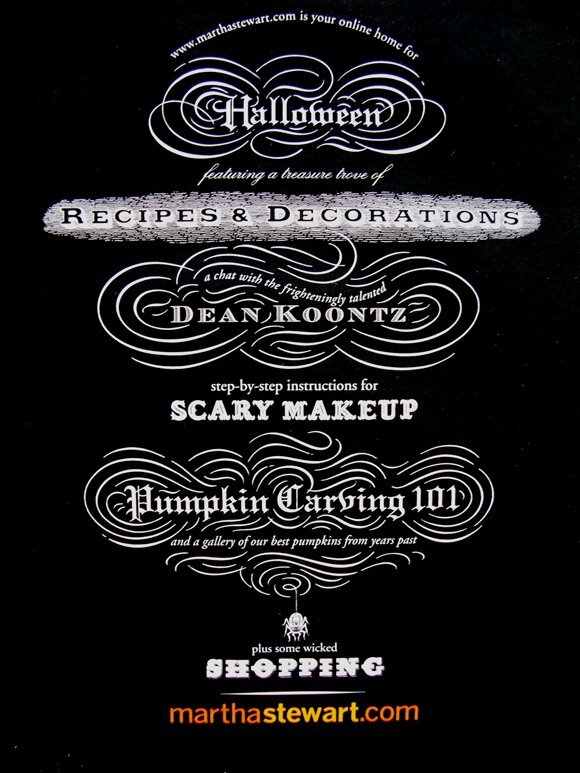 In the absence of Martha by Mail the 'Shop' category of Marthastewart.com was redesigned to showcase the latest Martha Stewart books and product introductions. The website's first incarnation was very simple, but still quite advanced for the time with a mail-order shopping component, online subscription services and a social-media component. The website as it appeared in 2010. In 2008, Martha launched Martha University, an online repository of video content for sale. Many of the videos were from Martha's first television specials in the 1980s and from her program, Martha Stewart Living, which aired in the 1990s and early 2000s. The site was closed a year later. 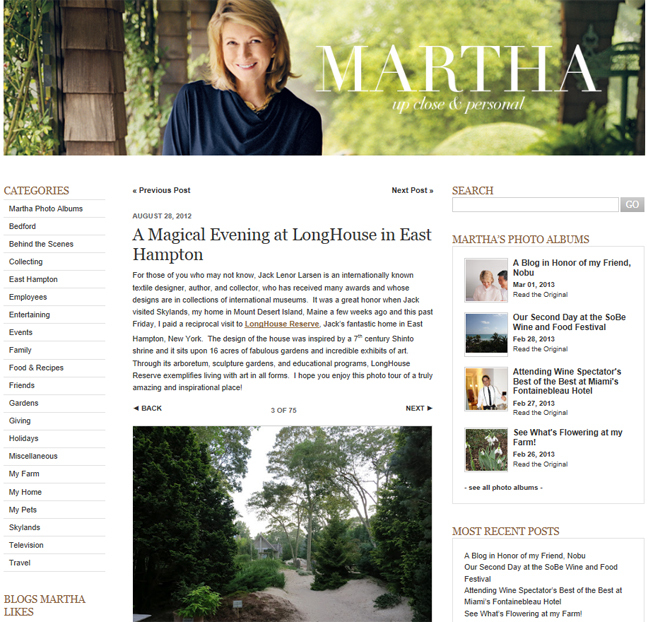 MarthaStewart.com as it appeared in 2013: a more blog-like appearance with less clutter and a more airy design.